Toil exhibition includes recent works by René Machado and open to the public from the day 16 April in the Casa de Cultura Laura Alvim. 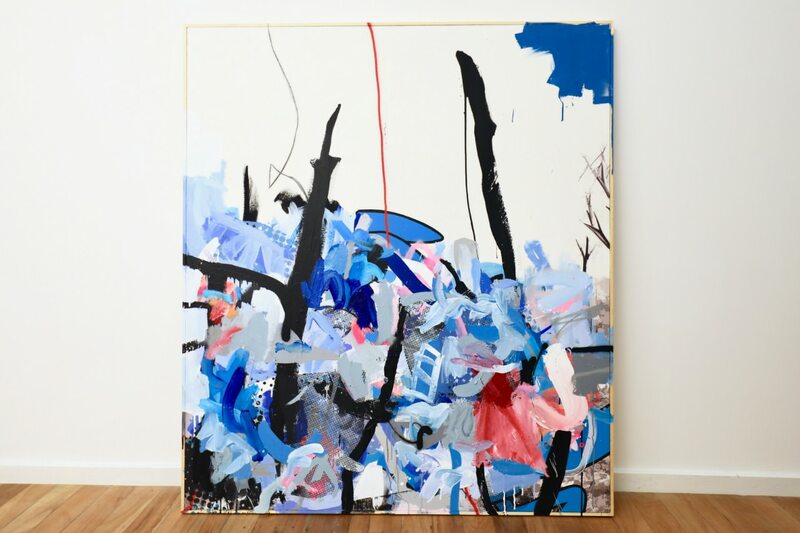 The artist revisits its origins as an advertising professional, incorporating them into the varied and vivid imagery of urban art and the artistic possibilities around “Abstract Painting” at the present time. It presents imponderable form the aesthetic force of the streets, graffiti, of street art, Pop Art with the push of neoexpressionistas strokes. 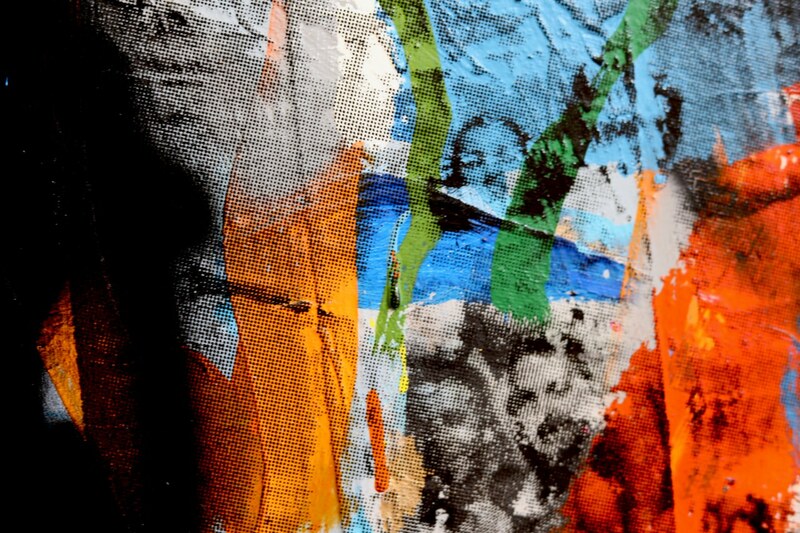 Explores the idea of ​​the ephemeral from the many overlapping layers of elements. 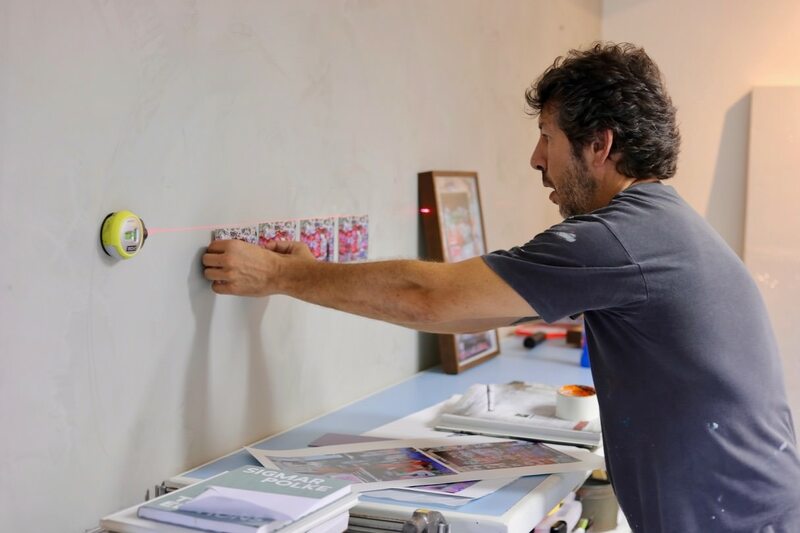 The artist makes use of screen printing as a mark of the industrial era, reproducibility, image wear, expansions, repeated images that resemble ads on city walls, overlapping spray strokes, and numerous layers of paint. "Part of the process involves: photography, Scan, print, screen printing, magnification and imaging to printing in large pictorial supports and inclusion of a number of layers. 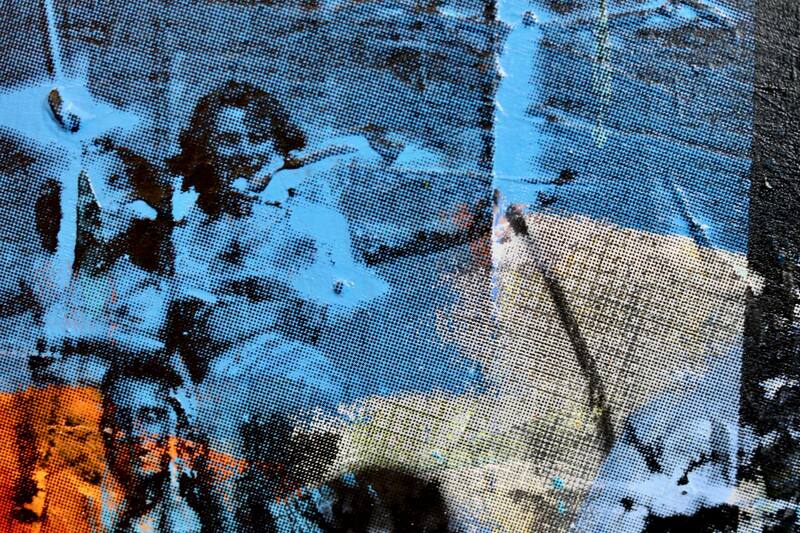 The work suffers interference of different techniques: oil, acrylic, synthetic enamel, coal and spray ", cites the artist. 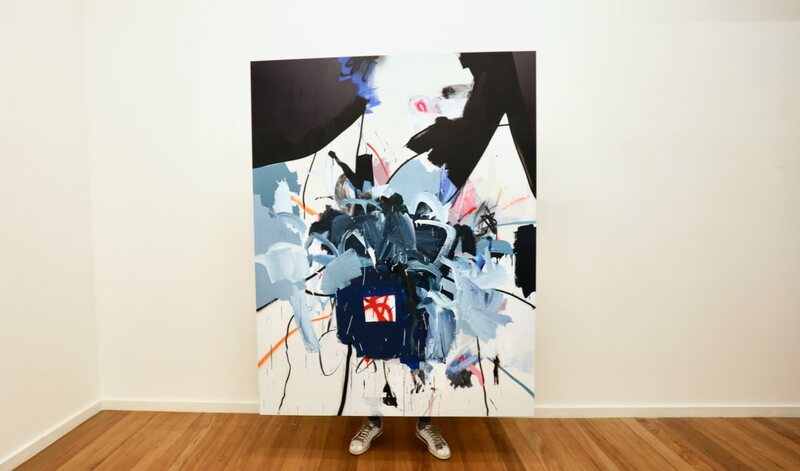 The unassuming result of René's work also comes from “action painting”, his uncompromising stroke, the free strokes, loose gesture – arising out of your style that needs no affectation. In this exhibition, some more sober explorations of green, blue – other more radical, bring pink and neon orange of the decade 90, interposed by radical blacks, operated by coal, spray, and synthetic enamel. According to the healing Vanda Klabin, the sliding movements is a process of articulating different ways of seeing, "The pictorial field pervaded by vibrant contrasts, dissonant harmonies, thick lumpy and high chromatic voltage, They have an ambiguous connotation. Color is its expressive vehicle and reconciles disparate and discordant elements in the screen structure. "Said Vanda. 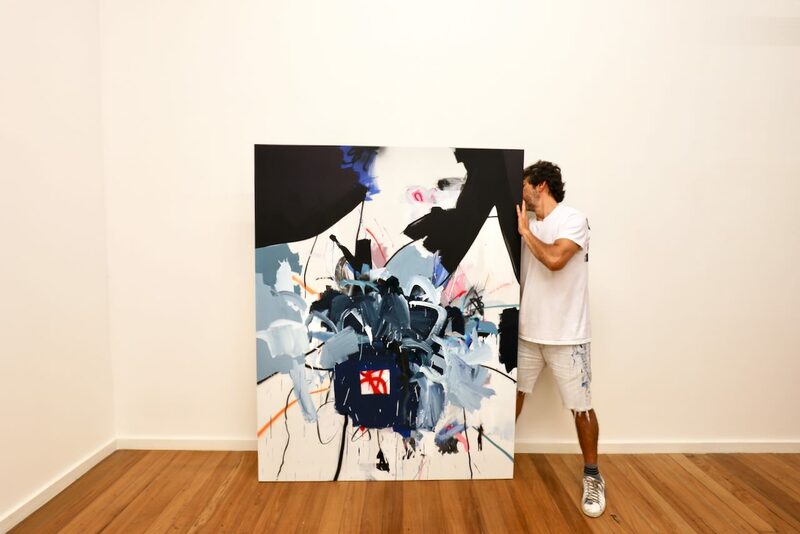 Part of the work is inspired by Rene calls “Frequency Morelenbaum ", the latest inspirations came from sounding album of compositions Jaques Morelenbaum Brazil Central, "Whenever I heard this album, I wanted to decipher the compositions through gestures, then produce works in their pace ". Reveals the artist. In this exhibition René brings news like photography, bonding and installation dimensions of revealing new creative process. photography, or as a breakdown and sometimes as inspiration for the screens, It contains cityscapes, walls, panels captured in city centers like Paris, Berlin e Barcelona. The ever-watchful eye on the aesthetics of the ephemeral, posters debris, charcoal, fixings, peeled paintings, They are captured by the artist. The bonding appears as a related content paint, from a more popular material is cardboard. Originally from popular brands of product boxes the material was worked with predominant colors on the screens during the creative process, cuts, and bonding free slots, still reveal new dimensions to the concept of decomposition and randomness. "Deconstruction, do and redo part of the process, overlays, erasures, trial and error signals and thereby composing the layers will, creating random abstract ", says René. René Machado, close da obra. Photo: Disclosure. RENE MACHADO born in 1969. Lives and works in Rio de Janeiro. Graduated from the School of Visual Arts of Rio de Janeiro, It has in painting the main focus of research and action, but also develops work in the design field, installations and art direction. The work for more than 23 years in advertising gives your work influence of colors, painting and drawing, and the ironic relationship of advertising to the ephemeral. 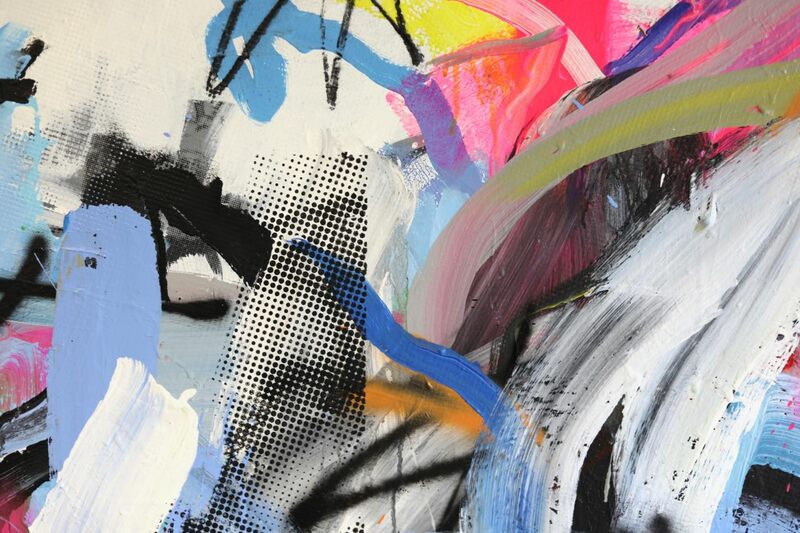 His work is part of a lineage of artists who seek scour the possibilities of painting after the technical bangs, visual and conceptual caused by Pop Art or, yet, by neoexpressionistas the years 1980. René holds exhibitions since 2009, having his works traversed different countries and art institutions such as: Brasil, USA, Italy, Spain and France. Emphasis on participation at Art Basel in 2014 by San Paul Gallery, Map of art no ano de 2015 in Venice and exposure “Gestures” in 2016 the Casa de Cultura Laura Alvim. 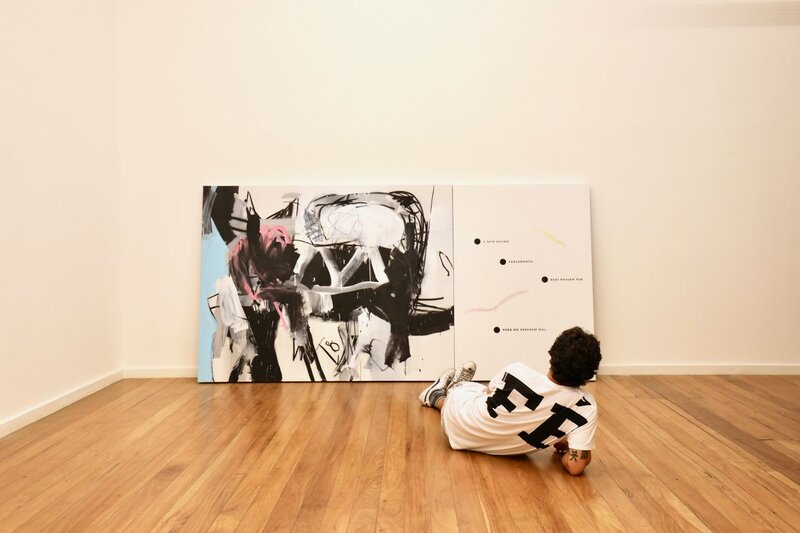 René Machado was included among the 100 contemporary artists chosen for the book Luciano Benetton Land of the Future / Contemporary Artists from Brazil. Rio de Janeiro, where he lives and works. It is a social scientist, historian and curator of visual arts. She holds a degree in Political and Social Sciences from PUC-Rio (1967– 1970) and Art History from the Uerj (1975-1978) and graduate in History of Art and Architecture in Brazil PUC-Rio (1980–1981), where he served as assistant coordinator of the course (1983 -1990)) and editor of Gávea, Department of PUC-Rio History (1983–2002). He was director general of the Municipal Art Center Hélio Oiticica, Rio de Janeiro (1996–2000), where he organized several exhibitions of Brazilian and foreign artists: Amilcar de Castro, Manuel Antonio, Eduardo Sued, Guillermo Kuitca, Hélio Oiticica and the American Scene, Iberê Camargo, José Resende, Luciano Fabro, Mel Bochner, Mira Schendel, Nuno Ramos and Richard Serra. It accounted for curators from various institutions, featuring works by artists such as: Alfredo Volpi, Angelo Venosa, Antonio Dias, Celia Euvaldo, Daniel Feingold, Eduardo Sued, Frank Stella, Henrique Oliveira, Jorge Guinle, Nelson Leirner, Niura Bellavinha, Nuno Ramos, Renata Tassinari, among others. He was assistant coordinator of National rediscovery shows - Biennial 500 years, in São Paulo (1999–2000) and curator of the module "The constructive will in Brazilian art", 1950/1960”, Exposure integral Art in Brazil, no Festival Europalia, apresentada No. Fine Arts Palace - Bozar, Brussels (2011–2012). Worked in memory preservation area of ​​cultural collections and research activities - Oswaldo Goeldi File, Funarte / PUC-Rio; Alberto da Veiga Guignard file, Department of History, PUC-Rio; Raymundo Ottoni de Castro Maya file, Museu da Chácara do Céu, Foundation Museum Castro Maya / Iphan / Vitae Foundation - and cataloging of Antonio Carlos Jobim acquis, Faperj (2002–2004). Regularly participates in various advisory boards culture: Museu da Chácara do Céu, Raymundo Castro Maya Foundation, Rio de Janeiro (since 1993); Paço Imperial, RJ (since 1993); Dia Center for the Arts, New York (1997–1998); International Council of Museums - Icom (since 1998); Council of Culture of the Commercial Association of Rio de Janeiro (since 2004). Member of Pipa Prize Nominating Committee 2015 and 2019. In the editorial area, coordinated several publications, as well as catalogs and research on art history, attending seminars on the subject. It has several works published in books and journals. He currently works as an independent curator.